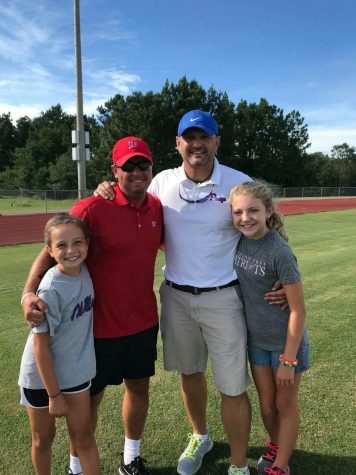 The Jackson Prep soccer team received a new assistant coach this season. Coach TJay Busin grew up in Texas, but moved to Mississippi and attended Northwest Rankin. He’s been playing soccer since he was six, and his career as an athlete has been very successful. In highschool, TJay was awarded MVP on his school team for both Junior and Senior year. He also played on a select team which won the U-18 Nike National Championship in Atlanta, Georgia. After high school, TJay went to Hinds, and later Mississippi College. From 1997-2003, he was a member of Brilla and played soccer in six different countries. He also played professionally for the Jackson Chargers and was the youngest player drafted in the USISL during that time. After this exciting experience, TJay returned to Mississippi and was the goalkeeper at Holmes. Coach Duncan, the head soccer coach, has known TJay for a while. The two played together on a JFC team, so it’s fun for both of them to be able to continue in their passion together. Outside of playing soccer, TJay has other passions. He founded Buzini, which is an elite sporting uniform company. He also co-founded ProD. This is a training facility with highly experienced instructors. Athletes may rent cages and mounds to practice and improve their sport. More than this, TJay has a seat on the board of a non-profit charity. He has a love for soccer that can clearly be seen in his desire to help other players improve. His vast experience and years of playing are something that is going to be a great addition to Jackson Prep.